Key supporters and the parishioners of Boughton celebrated the official opening of Boughton Fen Wildlife Walk last weekend. Over the past seven years, an enthusiastic and dedicated group of volunteers on behalf of Boughton Parish Council have been working on Boughton Fen, a Site of Special Scientific Interest (SSSI) and County Wildlife Site (CWS), to improve the natural habitat and raise its classification within its SSSI status. In order to make the 44 acre site of wetland more accessible to the public a circular wildlife walk was constructed with generous funding from the National Lottery. Chairman of the Boughton Fen Committee, Mark Pogmore said, “Everyone has done a magnificent job and we are immensely proud to have such a wonderful asset on our doorstep which has provided the village with an award winning wildlife walk.” Awards include; CPRE Award, Boldero Award, Norfolk Biodiversity Partnership Award and a Lloyds Bank Community Award. The summer solstice provided brilliant weather and the perfect opportunity to stage this landmark achievement by Boughton Fen Committee. Participants walked the cut paths and boardwalk created and maintained by the Committee and its army of willing volunteers. Guest of honour to cut the ribbon was Joy Boldero who, with her late husband Charles walked most of Norfolk and wrote about their walks for the benefit of others to enjoy. 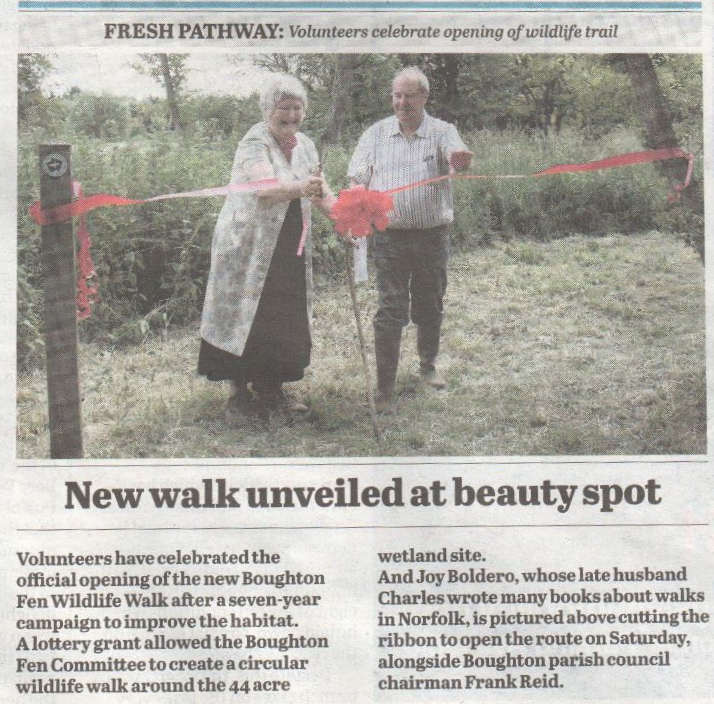 The image on the left is taken from the Friday Lynn News, dated 27th June 2014 and shows Joy Boldero 'cutting the ribbon' to officially open the Boughton Fen Wildlife Walk. In the first of a series of features on the winners of this year’s CPRE Norfolk Awards, rural affairs correspondent CHRIS HILL meets the community volunteers behind a project to rejuvenate a lowland fen for wildlife and walkers. It’s difficult to imagine that the secluded Wildlife Walk where visitors can now marvel at the birds and animals of Boughton Fen covers an area once deemed “unfavourable” to nature. But now this project, which began as a conservation scheme and grew into a an all-inclusive labour of love for a whole community, is set to be given county-wide recognition as a winner in this year’s CPRE Norfolk Awards. The regeneration of the 44-acre site of special scientific interest (SSSI) near Downham Market has been achieved by the Boughton Fen Committee (BFC), a sub-committee of Boughton Parish Council. The committee was formed in 2007 after Natural England classified the fen as being in “unfavourable condition” in 2003, with encroaching scrub which was in danger of becoming a woodland, resulting in the loss of important habitat and wildlife. The process of reversing years of neglect began in 2008 with a Higher Level Stewardship agreement which funded scrub clearance work and rotational reed-cutting. And the next step of opening the area up for the enjoyment of the public was boosted with the award of £9,950 in Lottery funding in April 2011. Since then, a dedicated army of volunteers have installed 190m of boardwalk, cleared paths and placed marker posts for the 2.4km circular walk. Luckily, the parish could call on the services of an architect, an engineer, a quantity surveyor, a timber salesman and a Scout leader – who all lived locally and offered their manpower for free. Committee Chairman Mark Pogmore said: “The original idea was to return the fen to favourable status as a SSSI and then we thought: ‘We have really got something here and people cannot really see it’. We had quite a variety of people who have come down, and some people who have been here nearly every weekend. We could have done this boardwalk with contractors, but we bit the bullet and did it ourselves. “We couldn’t have done this without the Lottery money and we certainly couldn’t have done it without the volunteer help.” Mr Pogmore said the workforce was “helped enormously” by offenders on a Community Payback programme, while the entire project sustained a core of between 20 and 30 volunteers, from within a village of only 200 inhabitants. The fen committee now has more members than the Parish Council itself – and a greater annual spend. Boughton Fen now provides habitat for a wide range of birds, butterflies and dragonflies, with breeding birds including kingfisher, water rail, nightingale and 10 pairs of roosting marsh harriers. Winter visitors include bittern, great grey shrike and jack snipe. About 700 swallows come to roost among the reed beds every summer, while recorded mammal life includes otters, badgers and three species of deer. Allan Hale, a naturalist and BFC committee member who has monitored and ringed hundreds of birds on the site, said: “It is very important for wildlife. It is a nice oasis of really good habitat amongst intensive agricultural land. So many coastal reed beds are disappearing because there is a policy not to maintain flood defences, so every bit of inland reed bed is becoming more and more important.” The project will be completed in the next few weeks with the installation of information boards to raise awareness of the area’s flora, fauna and SSSI status, while possible future plans include grazing part of the fen with rare breed cattle.